A beauty from Virago Press, offering insight into so so much…with the heavyweights of Marx and Engels so pivotal in the life of Marx’s daughter Eleanor, this does very well I think, in focusing on her and through that prism giving real insight into the characters of the men even as they remain somewhat on the sides. It is nice for it to come this way around. This is a wonderfully detailed, meticulously researched biography that draws on a wealth of letters and personal documents, sorts through contrasting accounts, brings to life all of the vibrant personalities in these circles. And it’s only Part 1. The short one. It is undoubtedly sympathetic both personally and politically, and it is open in this, which I liked. Better the point of view that is expressed than that is hidden. Nor did I find it shying away particularly from unpleasantness, though my knowledge of the time and people isn’t particularly deep. My god, though, the emotional intensity of this family! It’s unexpected though I don’t know why I thought they would be more reserved, more academic. Well, I suspect plowing through Capital is part of that impression’s source. The emotional rollercoaster of their relationships with each other and people outside of the family is quite extraordinary to me as I do not operate in such a way. I knew of their poverty, but did not realise how it came in combination with the desire to keep up a middle-class front for the sake of the girls’ marriageability. After the two rooms they occupied in Soho in the heart of the refugee community after 1848’s uprisings (can you imagine the ferment and politics and wonder? ), they moved into houses they could not afford, the girls had piano lessons and drawing and such. They were constantly in debt and sleepless and living off of what Engels could send them. Marx’s aristocratic wife Jenny von Westphalen inherited money from various relatives at different points, and all of it was spent almost immediately on furniture, travel, an even bigger house…They had a servant, Lenchen, part of the family in a sense but I always wonder how much a servant can really be part of the family, and she was almost certainly the mother of Marx’s only son. There’s a long interesting footnote on that longstanding piece of gossip that illuminates the intricate relationship between Marx, his wife, and his daughters. Still, to imagine Marx working away on Capital in the midst of the madness is almost impossible, it is a wonder he managed it. The amount of time they spend traveling also struck me as a class privilege that they partook of extensively, again, funded by Engels. And yet at the same time, it is all to do with illness, extreme and lingering, mental and physical. So many children died, their lives where a string of tragedies and loss. They spent so long in this time before antibiotics and in the early ages of medicine fighting off sickness and disease, and Marx lost children and grandchildren while he was writing, Eleanor’s brothers, nieces, nephews. Their love of children is so evident, shining through letters and their frantic flying to be loved ones in times of trouble. The unhappiness of all three sisters is also striking, all of them falling in love with exiles of the Paris Commune and perhaps this love as doomed as the commune itself and the spirits broken in it. 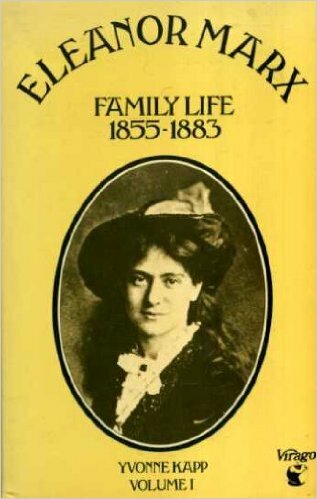 Eleanor Marx’s is the strangest, her year’s long and open and disapproved of engagement to Lissagaray that never comes off. There is so much of the daily lives of the family available to us through the letters, but these tantalising areas remain completely opaque and we shall never know the truth of what happened and why. Perhaps Eleanor was lucky, her sister Jenny living in desperate poverty through the frequent arrests of her husband and his exile, working to support the family and also raising it. Watching her child die. Run ragged and aged before her time in taking care of those who survived. It is the future I have always been most afraid of, and she died just before Marx did. I cannot imagine the sorrow of that time for Eleanor, losing her mother, then within a few months, her sister, father and nephew. Being so surrounded by death — and that this is no unusual thing — is something that I think now, for those of us lucky enough to live where some level of medical care exists for all, is almost unimaginable. I can’t help but feel after reading this that if I can’t better understand that reality, then I can’t understand how people chose to live what life was given to them either. At the end we meet Edward Aveling, a few chapters on his raising and life before Eleanor. He is so vilified, and in many ways rightfully so, but I am glad Knapp attempted to also find what was good in him. There must have been something to attract the vibrant, intelligent Eleanor to him in the first place. Still, I was hoping for something better. I read with so much sympathy and worry of her attempts to get just a little distance from the family, find herself through work as a teacher, research at the British Library, a career on the stage. And all of this against a background of revolt — there is also much in here on the lives of those exiled from France, on the formation and fall of the International Working Man’s Association and socialist politics after its passing. I wanted more in fact, but rested content with limiting it to maintain Eleanor as the focus — she was very young and while influenced by these things, she did not play the central role that she would come to play in building a socialist movement in Britain. That is the subject of volume 2, and I am looking forward to it.